As ever, a mix of old and new on WowHaus, with below being the pick of the retro houses listed and for sale this week. High on a hill and dating back to 1968 is this amazing, single-storey period gem (pictured above). As a nice bonus, little has changed over the years – except the price, obviously. A few of these Sun Houses were built in the 193os, with this being one of two on the market. Like the other one, this has the original modernist exterior, but a very modern inside. Unlike the other, this one has an annexe (in keeping) attached. A stunning property on Lytton Close dating back to 1935, it is well preserved on the outside and pretty well looked after (but updated) inside. A lovely bit of deco – at a price. Dating back to 1975 and built in the old orchard of Latimer House as the accommodation for the commander of the National Defence College, this place is very much of its era and unchanged by and large, over the 30+ years since. First time on the market for this 1967 build, which has been maintained and made over to a high standard and very much in line with the original era. 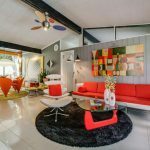 A retro house with a retro interior. Another house with a makeover, this time one dating to 1966, built by and for the architect and with all its original features maintained. However, there is the bonus of some modern-day essentials too, like a new kitchen and bathroom.